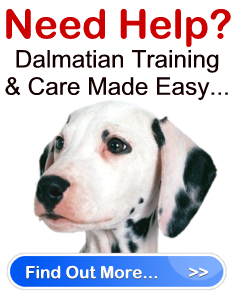 Dalmatian Care And Deafness In Your Dog " "
Dalmatian care starts at an early age, even before you bring your new puppy home. The reason is because Dalmatians are prone to deafness. In fact, it is estimated that 10-12% of all Dalmatians are deaf. This makes the Dalmatian the breed most prone to deafness. He doesn’t respond to commands when you speak them, and only reacts to you when he can see you. He sleeps longer than usual and doesn’t wake up unless you physically touch him. If you think your dog is deaf, take him to be properly examined by the vet. If in caring for your Dalmatian you discover that your dog is deaf, do not let this bother you. Just because your dog can’t hear you doesn’t mean he will be any less of a companion, or that you will have less control over you dog. You may also be under the impression that Dalmatian care for a deaf dog will cause more anxiety than caring for a regular dog. For instance, you may think that a deaf dog has a higher chance of getting hit by a car because he can’t hear it coming. This is untrue. Most dogs that get hit by cars are off their leash and are chasing after something and have no idea that a car is a danger to them. Therefore, as long as you keep your dog on a leash, you won’t have a problem keeping him safe, regardless if he is deaf or not. Another good idea is to make sure you mention your dog is deaf on his ID tag so that if he ever becomes lost, the person who finds him will know. Finally, if you would like to learn more about deaf dogs and how you can provide them with the best Dalmatian care, visit Deaf Dog Education Action Fund online at www.deafdogs.org.